Sundays are the days I go the ocean and make my offerings to Olokun, African deity of the ocean depths—the bringer of good things to those who walk the earth. Prosperity, children, wealth, and strength—inside and out--we are blessed. They say where he…she…he…it lives is only inhabitable by the most resilient and adaptable creatures. Able to survive complete darkness, crushing pressures, and grave-like cold, these things go about in all their “otherness,” frightening to behold in their unapologetic oddity. Nonetheless, “others” endure because there is little else to do in a world of murky solitude. So, on Sundays I throw fistfuls of roasted corn and pork rinds into the sea. I crack open a bottle of red wine and pour libation. The cresting waves turning blackish purple, as wine mixes with salty brine. The waves crash in and take my offerings out to his…her…his…its icy depths. I love you, Olokun, I think to myself, as seagulls circle overhead, catching my prayers in their beaks, flying off to deliver my silent words. I gaze out into the great expanse of blue and feel small in the presence of The Infinite. Headed back to my car—the waves crashing in my ears, I noticed some scribbling on the sand. “I love you, too,” it says. Continuing to my car, I don’t feel so small anymore. True story. My father kept to himself, seeking the dark quiet of his room with its door that was always closed. But in the mornings, he would cook breakfast for us. I remember the smells of Folger’s and the slow burn of bread that pulled me from my bed to the kitchen every morning. A plate was always waiting for me at the table with its usual fare—two eggs, 3 sausages, and 2 pieces of buttered toast. I would look over to him at the sink, where he would stand, taking sips of coffee between giant bites that would polish off his slice of toast and red plumb jam in no time at all. Every day his head seemed to hang lower and lower. Too many thoughts, I suppose. Funny thing to notice as a kid. His shoulders appeared heavy, defeated, burdened with the weight of his small world. I would watch and wonder when he would leave, but he never did. Some nights I would catch him at the kitchen table with his big iron box that was meant for his “important papers,” but my mother always called them “bills.” Papers with lines. Papers without. Papers with numbers. Papers in envelopes he never let us see. All covered the tabletop, threatening to spill over the sides like milk from a toppled glass. I would watch him, as he sat beneath the kitchen light that hovered over his head like a halo. His head and shoulders still hung low but heavier with a world that was becoming bigger and bigger, as he circled the rim of his coffee cup with his finger. I wondered when he would leave, but he never did. I woke up one morning to the smell of blueberry pancakes—the kind my mother used to make on special occasions or when there was bad news. I was twelve. before it dissolves like sugar in the rain. this wringing is all I know. BIO: David Estringel is an avid reader and poet. Writer of fiction, creative non-fiction, & essays. 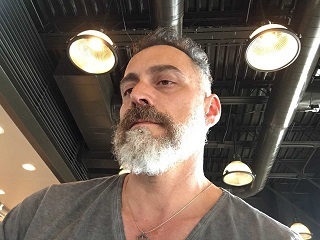 His work has been accepted and/or published by Specter Magazine, Literary Juice, Foliate Oak Magazine, Indiana Review, Terror House Magazine, Expat Press, 50 Haikus, littledeathlit, Route 7, Down in the Dirt Magazine, and The Good Men Project. He is currently a Contributing Editor (fiction) at Red Fez and editor/weekly columnist at The Good Men Project. David Estringel can be found on Twitter (@The_Booky_Man).